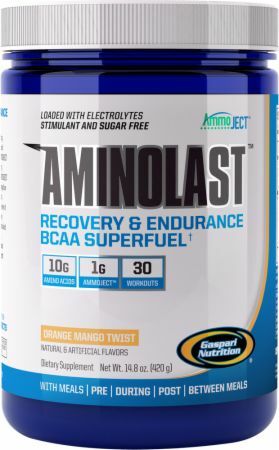 Gaspari AminoLast is a great tasting amino acid drink that can be taken pre workout, intra workout, or any time during the day. To get the most out of this supplement, we recommend reading our full, comprehensive AminoLast Review, where you will also learn a bit about BCAAs in general. BCAA supplements like Gaspari Aminolast have their place in a bodybuilder’s arsenal of muscle building and fatigue fighting supplements. But do you know why? Consider the ‘dream’ BCAA supplement and what amino acids do in general. Amino acids as you already know are the essential building blocks for muscle. Some are made naturally in your body (often byproducts of metabolism) and some we as humans do not make but require for survival. In the traditional American diet, you do receive all of your amino acids. But, you’re not getting enough. With a traditional diet, you’re certainly getting enough protein to maintain your current muscle profile; but rarely are you getting enough BCAA’s (branch chain amino acids) to stimulate an anabolic muscle growth effect. It’s a simple case of supply and demand, and when your body is low in supply all it cares about is survival and will not expel the extra resources on expensive muscle building. This is where the ideal BCAA supplement comes into the picture. When you take a BCAA like Gaspari Aminolast, it’s specifically loaded with all the branch chain amino acids that your body cannot make naturally. 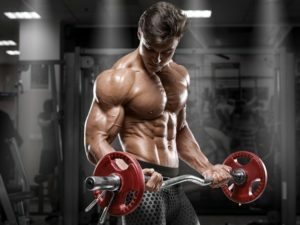 These are often the ‘rate limiting factors’ when it comes to building muscle, and once you provide excess amino acids a noticeable amount of genetic barriers will lift and allow enhanced muscle growth. When you go to the gym, lift good weights, eat a balanced diet, and then throw some quality leucine loaded AminoLast on top of all that – the magic happens. I can personally attest to seeing in myself and the men (and young men) I train with immediately begin increasing lean muscle mass while cutting fat when taking BCAA supplements appropriately. Why does this happen? First, like we explained pathways open up to allow additional muscle growth. Leucine in particular is a major anabolic switch when in high concentrations, that acts as both a building block and a signaling factor to your body. But, we weary – because both the signaling and utilization of leucine reduces its concentration. So, consistent intake is key with an increased uptake immediately before, during, or immediately after working out. Gaspari AminoLast contains 2.5 grams of leucine per serving. But wait, we also said guys are cutting fat, how does that work? Well, we mentioned that non-essential amino acids (the ones you make yourself) are often byproducts of metabolism. Well, when you influx all these essential BCAA amino acids the muscle building engine begins and it also requires non-essential amino acids. This creates a deficit of non-essential amino acids which in its own way stimulates your metabolism to create more. We’ve tried a lot of different BCAA supplements and Gaspari Aminolast definitely earns its place as one of our top picks. We made this determination through the staffs own month long BCAA trial with Aminolast as well as overwhelming feedback from fellow bodybuilders. Based on this, you can see Aminolast on the Best BCAA Supplements Ranking. There were many things we liked on both the science and experience side of Aminolast. For starters, this BCAA tasted great and mixed in water quickly when shaken in a bottle. From there, we all noticed endurance increases in the gym while supplementing intra workout as well as feeling anabolically solid after workouts. Something that may not mean very much to others but means a whole lot to us is that in Aminolast – Gaspari uses natural flavors and does not incorporate artificial flavoring or dyes. In a world where everything has some poison in it, this matters to us because as bodybuilders we do our best to maximize health for gains. All in all Aminolast was a solid Intra Workout BCAA. Its affordable, tastes good, and doesn’t have preservatives. We recommend this supplement to men and women alike with goals ranging from building muscle to cutting down fat. Practically any route you go, this supplement will benefit you when taken accordingly with a proper diet. 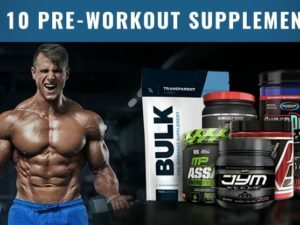 We highly recommend you check out our complete intra workout supplements list to compare similar supplements. If you have any questions tag us directly below and we’ll get back to you as soon as possible!